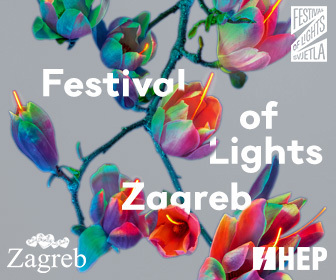 This is the third edition of the Festival of Lights Zagreb which will take place from 20 to 24 March. Owing to an extraordinary impression that the previous two editions left on them, the citizens of Zagreb and their guests are looking forward to this year’s festival which is dedicated to spring. The Festival will take place in the historical centre of the city, in the romantic Upper Town. Owing to modern lighting solutions enabled by top notch lighting technology, the arrival of spring but also symbolical awakening, growth and renaissance will be accompanied every day from 6 to 11 PM by imaginative light shows, audio visual installations and projections. By organising the Festival of Lights Zagreb, a manifestation that attracts and thrills numerous visitors, the Croatian capital joined a string of world capitals such as Lyon, Amsterdam, Helsinki, Prague, St. Petersburg and Berlin. The Festival is supported by the City of Zagreb and organised by the Zagreb Tourist Board.